Petaling Jaya – More often than not, we rely on automated tools (i.e softwares) to monitor social media. There are more than 250 companies globally that offer social media monitoring tools which automate our daily tasks. As the internet and social media users continue to grow exponentially, measuring a brand or consumer sentiment becomes an important element to arrive at the right strategy and decisions for many businesses and organizations. According to various research studies and recent findings from FreshMinds, a research consultancy in the UK, found that sentiment accuracy from various social media monitoring tools, on average, was between 30-60%. 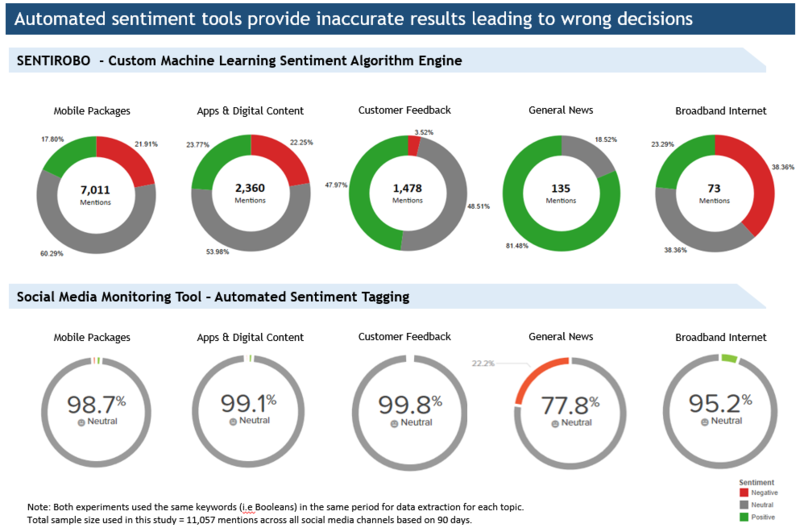 We are delighted to share with you a comparison analysis between our own custom text algorithm engine, SENTIROBO vs. automated sentiment by a social media tool. Our service based solution and offers in sentiment and emotion analytics on complex multilingual text data including dialects in Bahasa and English to a high degree of accuracy up to 87%. “The result from various sentiment analysis on different topics show that one cannot blindly rely on automated tools to process sentiment from social media data; which effectively can lead to wrong strategies, decisions and actions.” says Shahid Shayaa, Managing Director and Founder of Berkshire Media. Using the right approach can bring meaningful and more actionable insights from social media data. Specialization in Bahasa Melayu (i.e Malay language) over the last five years has positioned Berkshire Media to understand the complexity of the language vis-a-vis local dialects, nuances and non-dictionary based keywords. A custom built text algorithm engine known as SENTIROBO is capable to process sentiment and emotions from text based data with a high degree of accuracy as compared to the traditional Natural Language Processing (NLP) method. Note : Bahasa Melayu is a important language of the Austronesian family spoken in Brunei, Indonesia, Malaysia and Singapore. We estimate that the language is used by 290 million people in Malaysia and the eastern coast of Sumatra in Indonesia, and has been established as a native language of parts of western coastal Sarawak and West Kalimantan in Borneo. It is also used as a trading language in the southern Philippines, including the southern parts of the Zamboanga Peninsula, the Sulu Archipelago and the southern predominantly Muslim-inhabited regions in Thailand.